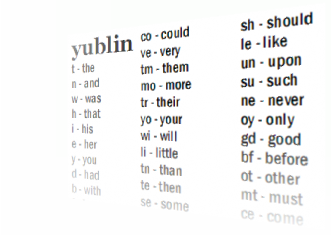 Introducing Yublin (PDF cheatsheet), a shorthand for the 600 most common words in the English language. For use in journals, notetaking, and writing novels, this shorthand system reduces the most frequently used words to 1- and 2-letter combinations ("shortcuts"). It's convenient, it's fast, and it's fun! (Interested in generating Yublin shortcuts for your language? Use the online form). How I generated the list. I started with a list of the 600 most common words in English. I then proceeded to assign 1-letter combinations to the most frequent words, followed by 2-letter combinations for the rest. For the most frequent words, the algorithm tries to choose shortcuts that are similar (e.g., t for the, sh for should, ng for nothing). Shortcuts must save at least 2 letters, otherwise they are discarded (thus there are no shortcuts for 1- and 2-letter English words). Below are the Yublin shortcuts for the 100 most common words. For the full 600-word list, see the cheatsheet (PDF). posted by Jonathan at 6/08/2007 08:56:00 p.m.
By Jonathan, at 6/09/2007 9:06 p.m.
is it possible to post your src code ? looking at this reminds me of the rules in porter stemmer. haha I was intending to do a dutton speedword software to add into babelfish (english-dutton speedword) but sadly I couldnt find the word list around. By zeroin23, at 6/17/2007 10:38 a.m.
Might give it a try after playing with Dutton a bit. Learning only the top 10 words is a 25% boost. "Transcribed by Richard Kennaway from the 'Dutton Speedwords Dictionary'"
By Anonymous, at 7/28/2007 3:33 a.m.
Anon - Great! Hope it helps. By Jonathan, at 7/29/2007 11:27 a.m.
By Anonymous, at 12/19/2008 4:13 p.m.
By Jonathan, at 12/19/2008 9:38 p.m. This site is about Keyscript Shorthand. Keyscript saves on averafe 60% of the writing and ultimately generates a list of word abbreviations, as Yublin does, but because the abbreviations are based on the simple rules of Keyscript they do not have to be memorised by rote. By cassyjanek, at 4/08/2009 4:21 a.m.
johnathan I must say that I am impressed. Just as a mental exercise I will be learning yublin. It's not often one can say that they personally invented something practical, and shared it to boot. Well done sir. By Phil, at 5/03/2010 9:54 p.m. Cool stuff Phil - hope it's useful to you. By Jonathan, at 5/03/2010 10:28 p.m. I have added the Yublin 100 and the Yublin 600 (broken down by word into letter groups) to Quizlet for anyone that would like to use that method for learning. By Michael Düx, at 7/25/2013 7:39 a.m.
By Jonathan, at 7/26/2013 9:56 a.m. Thank you very much for this. It's pretty cool you shared it. Can you maybe post the source code again? The ning-Link says "page not found" and I'm really curious how you did this. By Anonymous, at 8/29/2013 11:30 a.m.
Alas, I wish I still had the source code, but it is long gone. By Jonathan, at 8/30/2013 9:37 p.m.
You can use AutoCorrect in Microsoft products to use this shorthand while typing. Enter t = the in the dictionary and when you type "t", "the" will appear. By Anonymous, at 1/16/2014 8:39 a.m.